With over 50 species Echinocereus is sometimes referred to as the ‘Hedgehog Cactus’. They can be grown in containers and are suited to growing indoors. Mostly from Mexico however through in the USA as well. Generally regraded as an easy care plant, grow them for the foliage as well as the colourful flowers. These succulents are naturally low growing nature, this gives it the common name, however with species such as Echinocereus viereckii morricalii (pictured right) having such wonderful vibrant pink, flowers we think they deserve better. 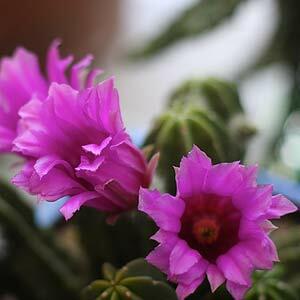 They are variable group of cactus with different flower colours and growth habits. Echinocereus reichenbachii and Echinocereus triglochidiatus are popular species. This particulare group of cactus that are in demand from collectors, however not usually readily available in Australia. Grown in containers for the wonderful flowers as well as the spiny plants themselves they are an easy care plant for beginners and collectors alike. Usually container grown these are not large plants, they do require a free draining potting mix and a sunny position. They do well indoors on a sunny windowsill. Water only when dry and fertilizer with a liquid or slow release fertilizer. Soil – A growing medium that is free draining is essential, we suggest a regular cactus and succulent potting mix for best results. Position – These are a succulent that prefer good light, full sun to strong filtered light will be required for good growth and flowering. Watering – The growing medium needs to dry between waterings. More water from spring to summer, less in winter. Fertiliser – Like many succulents these are not a hungry plant, a 1/3 strength application of a liquid fertiliser in spring and again in summer is generally enough. Repotting – Every 3 – 4 years you will need to repot as the potting mix begins to degrade. The easiest method of propagation is by the removal of offsets when repotting. You can also grow them from seed germinated in a heated propagation tray. The maim problems relate to overwatering and poor drainage, make sure the soil is never wet, and ensure drainage holes in containers do not get blocked. Lack of light will restrict flowering and growth. E. rigidissimus – Interesting form with an upright stem and large pink flowers. E. viridiflorus – Green flowers as the name suggests. E. coccineues – Scarlet red flowers. E. dasyacanthus – Attractive clear yellow flowers.